A hint of blackberry and bold peppermint will soothe your senses while the oatmeal works to relieve your overworked, tired, itchy and dry skin. Just because you have to work doesn't mean your skin can't get a day off. 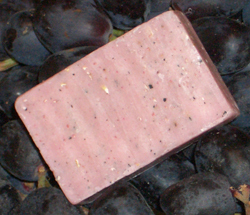 Hand crafted from the finest natural ingredients: Wine Grape Skins, Oatmeal, Peppermint, Palm Oil, Coconut Oil, Olive Oil, Water, Sodium Hydroxide, Fragrance and Essential Oils.